Mention Syrah and the name Qupé will soon come up. An original Rhône Ranger, veteran winemaker Bob Lindquist was one of the first to advocate American-made Syrah and other Rhône varietals such as Grenache, Roussanne, and Marsanne. He has been a leader in the movement producing world class editions since the early 1980s and continues his quest with the same zeal he started with. 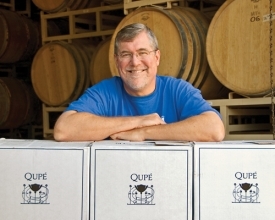 Consequently, Qupe has been deemed one of the Wineries of the Year for Wine & Spirits Magazine every year since 1999. In March 2015 he received the Lifetime Achievement Award from Rhone Rangers. Bob’s passion for wine is only equaled by his passion for the Los Angeles Dodgers.